Remember the Antrhopologie inspired wood bead necklace I made a few weeks back? Well, I have a ton of beads left and didn’t want them to go to waste. 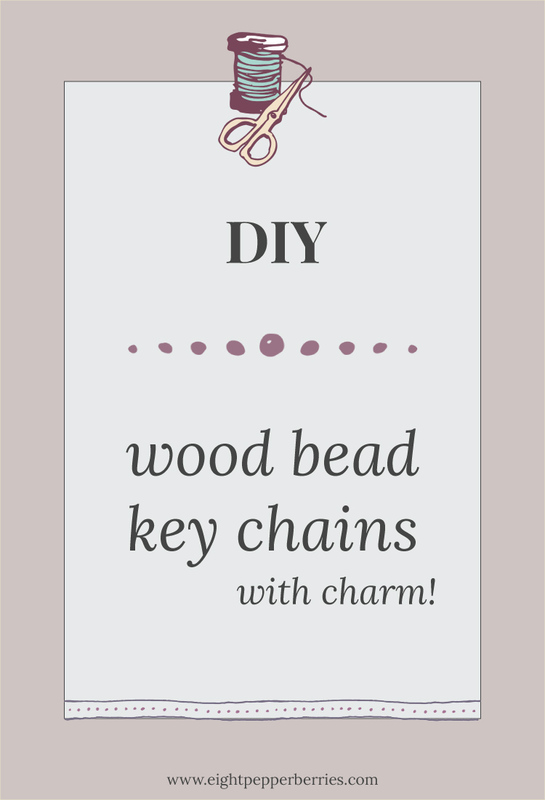 After cruising around on Pinterest for some ideas, I came across The Sweetest Occasion’s wooden bead key chain and was inspired to turn my left over beads in to key chains for my sweet nieces. 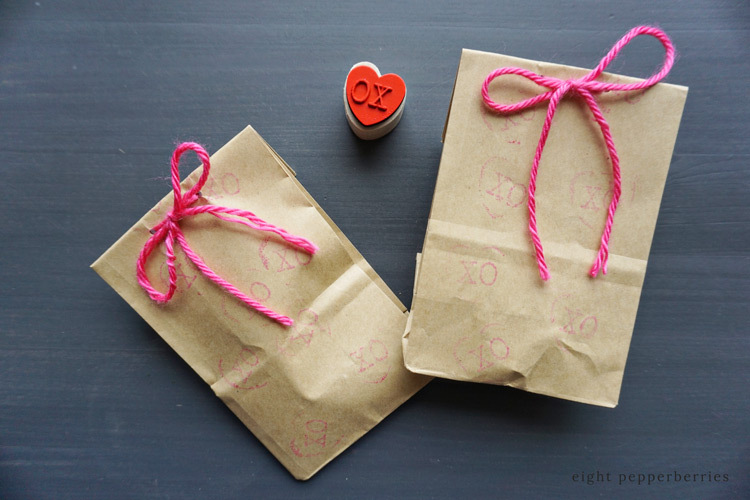 With Valentines Day only a few days away I thought I would make some gifts [cute packaging included]. 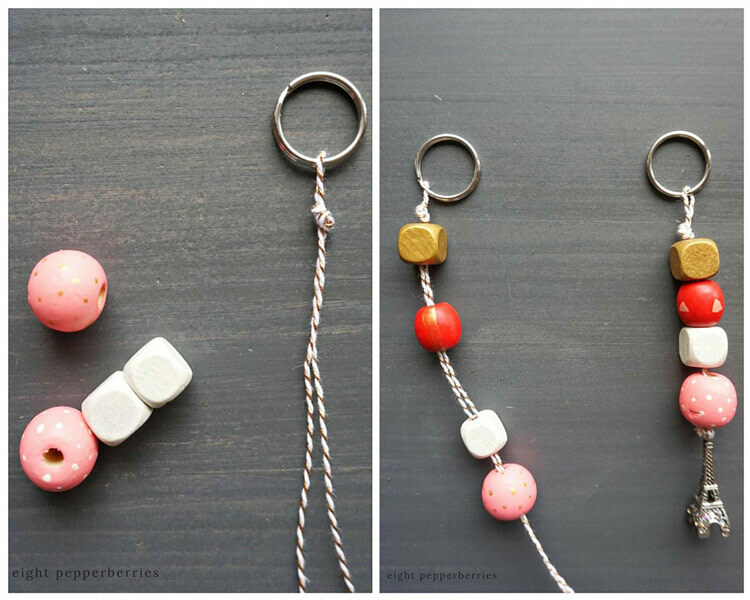 The key chains were fast, simple, and fun to make. These would also make a great craft for a kids party, especially that they don’t require any specialty tools and you can buy the supplies in bulk. The lighter pink and white took three coats of paint to evenly cover the beads, while the gold took two. Once fully dried, I added some dots, stripes, and triangles to the round beads. The white and gold square beads were left blank. Next, I cut a 24″ length of twine and slid it through the key ring to double up the twine. In order to secure the twine to the key ring I double knotted the twine at the top leaving some room for the ring to slide through the loop. The gold string easily frays so I taped the twine ends together to make a needle of sorts. I arranged my beads in to a pattern that varied in color, size, and shape then strung the beads on to the twine. After the last bead I tied a tight knot. Using the jewelry cutters I cut off the charm clasp and strung the charm on to the twine beneath the knot. I secured the charm by double knotting the twine and cutting off the excess. 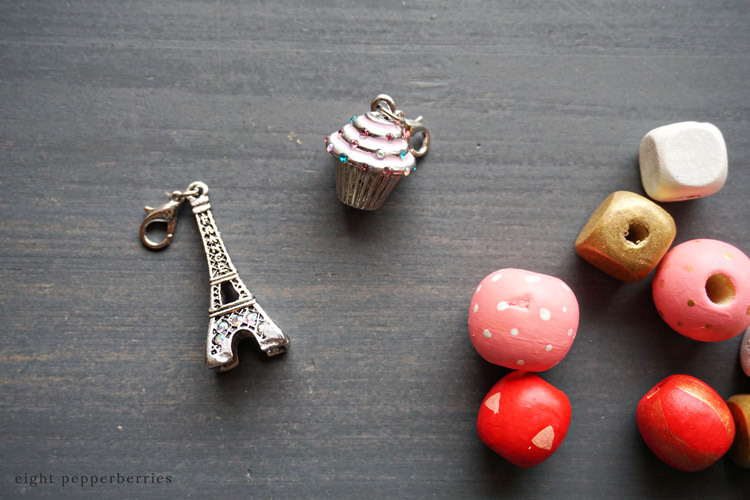 The charm adds personality to the key chain and reflects the lucky receiver. 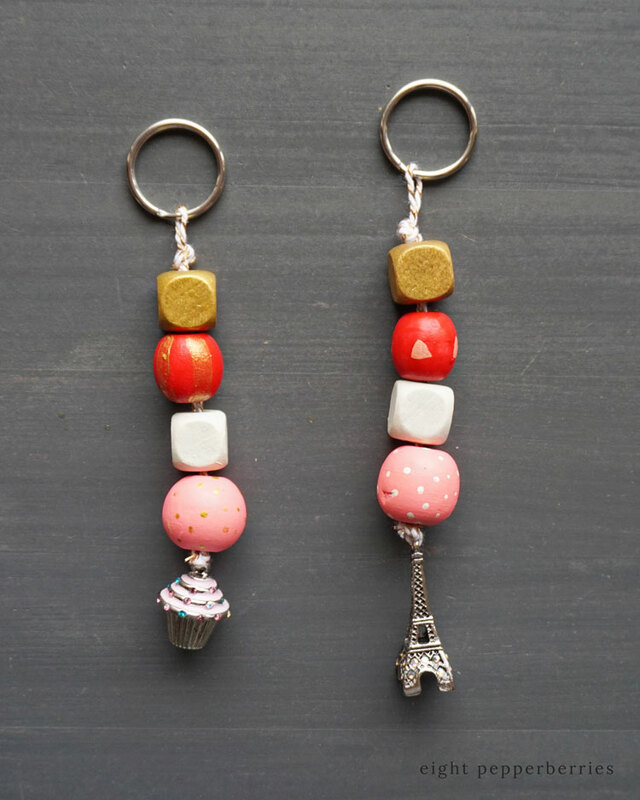 My niece A has a huge sweet tooth so she is getting the cupcake and my niece L is in love with Paris [just like her cool aunt] she’ll be getting the Eiffel Tower. 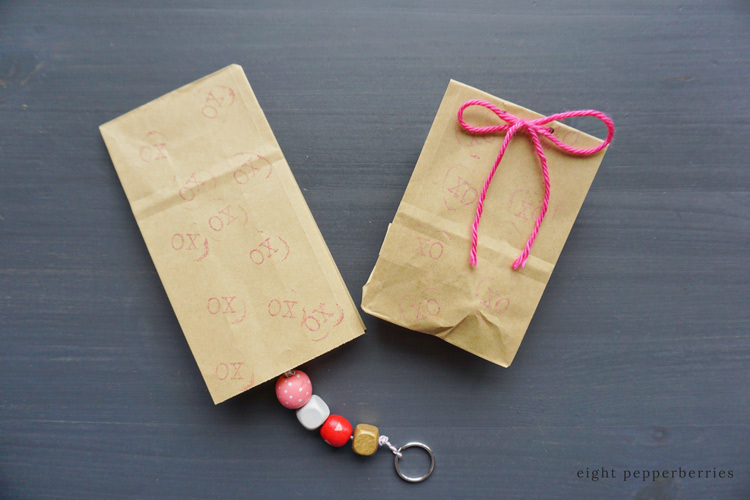 I love giving home-made gifts, and these key chains wouldn’t be complete without cute Valentines Day packaging. To be honest, this was a last-minute idea and I didn’t go out and buy any materials to wrap the gifts in. Instead I pulled items from my craft drawer – let’s get real, I collect craft items that I’ll someday use. Well today was that someday. 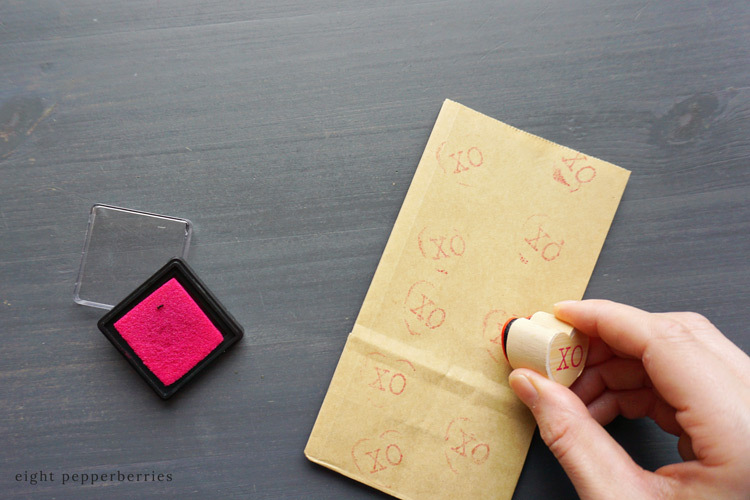 Using a heart xo stamp and pink ink, I lightly stamped the kraft bags in a random pattern. No need to get too overwhelmed with details, just go for it and have fun. [Side note – stamp the bags before you put the key chain inside]. Next, I folded the top over about 1 1/2″, punched two small holes in the center [1” apart], and strung hot pink yarn through to make a bow. Yay! Now the key chains are ready to be sent. Don’t forget to send it with a sweet love note. 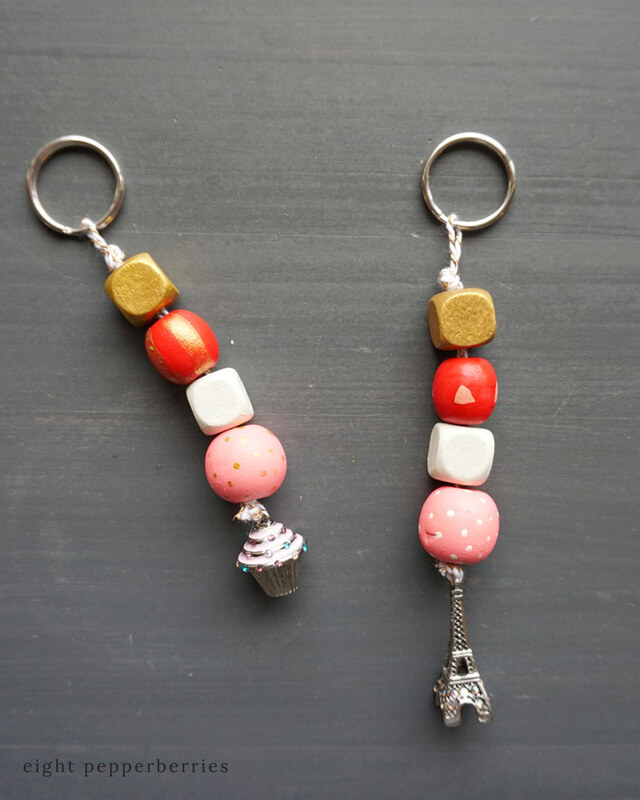 And no worries on if your recipient isn’t at the age to have their own set of keys – the key chain looks just as cute dangling from a backpack. Cheers to putting a smile on someones face this Valentines Day! 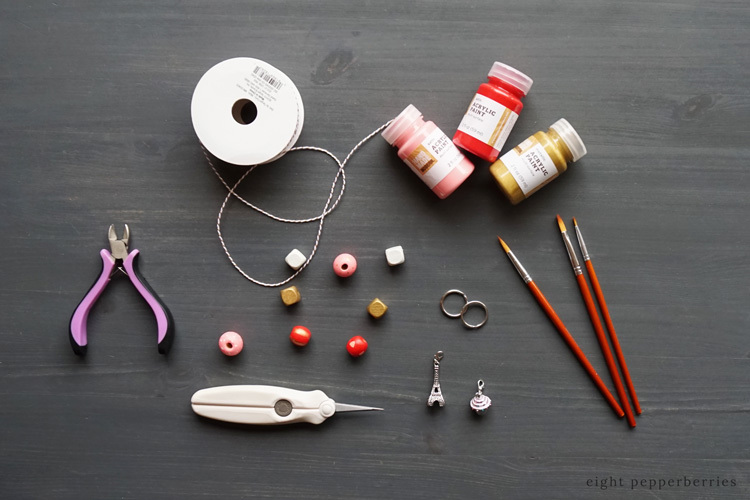 Join the Eight Pepperberries community & receive DIY’s straight to your inbox! Check out the Eight Pepperberries Library – this free library is filled with fun art prints, everyday printables, gift tags, and more. Its one big resource designed to add a dash of creativity and fun into your every day life. Just add your email to the list and you’re in!